The troll druid quietly slipped around the orc, helped the tauren to sit more comfortably against his cushions, and unobtrusively left, leaving the orc staring intently at her friend. Sunlight streamed in through the small window, creating a faint halo around his horns. Her eyes raked across him, noting the haggard sag of his face, the trembling in his hands, and the massive bandage around his torso. "You're a sight for sore eyes," the orc said. They grinned stupidly at each other. "Sore is right," the tauren replied, wincing as he shifted. "I feel like I was trampled by a stampede of kodo!" The orc folded herself down next to her friend. Seated, he still towered over her. She pushed away the knowledge that the injury was far worse than being trampled, that the druids had despaired of him waking, that he could have lost the use of his legs. He didn't need to hear those worries. Noticing a blanket folded at his feet, she made a show of draping it over her own legs, then casually tucked the other half across his knees. "I'm not a calf," he said shortly, reaching for the blanket. She ignored his hands and smoothed it across his lap. "I know that." "I'm not ready for pasture yet, either." His voice rose. "I know that," she replied mildly. Their eyes met for a tense moment. "You've got a while yet till you start losing your mane," she joked. After a pause his glare softened, and he snorted. "Earthmother send that I never wind up as bald as you." "You could never look as good as I do bald," she shot back, and the mood was just like old times. The orc tilted her face up, feeling the sunlight prickle her scalp. "Do you remember when we had to go swimming?" "To get those vines?" He grimaced. "I like swimming, but when everything in the water is trying to kill you..."
"At least you're good at swimming! If it hadn't been for those endless breathing potions, I wouldn't have even gotten into the water." They exchanged glances before downing their water skins together. The tauren shook his head, sticking out his tongue at the unpleasantly salty flavor. He waded in to the water, the orc following less eagerly. She stopped, immersed to her ribs, and frowned. "I don't know if I'll ever get used to breathing underwater," she muttered. Then, she sank under the surface, eyes squeezed shut, and breathed deeply through her mouth. Thanks to the magic of the breathing potion, the water was uncomfortable, but not choking. It swirled coolly down her throat and pooled in her lungs. She opened her eyes. The tauren had been waiting patiently for her and now kicked his hooves, moving towards the dark, sinuous patch of seaweed climbing the steep bank opposite them. Nestled in the undulating seaweed were the knots of slimy, strangling vines the druids needed for their forays into Tempest Keep. He did not relish fighting aggressive vegetation on the doorstep of Serpentshrine Cavern, but this would be their job until a new method was discovered. "But then, that one time we dropped by the hop field..." the orc said, eyes twinkling. The tauren scrunched up his face even as he smiled. "Ahh, don't remind me, it hurts to laugh!" They had been merrymaking at a small farm owned by a mutual friend and were leaving in the wee hours of the morning. Chuckling quietly, they staggered across the dry chill of Durotar, aiming for the Orgrimmar city gates. They passed by other small farms, including a small personal hop yard. The tauren gestured to the vines climbing the support trellis. "L-look," he slurred. "We could grab these and make-" he hiccuped, "-beer armor." The orc snorted. "Could enchant it to make drinks stronger to the wearer." Giggling, the orc grabbed a vine and wound it around his head like a crown. The hop clusters stuck out comically over his forehead. "I'm ready for Brewfest!" The orc began to laugh, doubling over and shaking helplessly in her drunken state. "Hop bracers could make you able to hold bigger, deeper mugs!" Suiting her words, the tauren grabbed another string of hops and wound it around one wrist. He fumbled, attempting to wrap the other, and finally gave up. The orc laughed hysterically at this display. "Don't-don't use too much," she cautioned, gasping with mirth. "You'll ruin the beer!" She leaned against a support pole of the trellis, then stumbled backward. Her hands grasped for purchase, finding only fistfuls of hops, and she fell gracelessly to the ground covered in vines. Forgetting where they were, the tauren let out a guffaw. "Now who's ruining the beer?" he challenged. Neither spoke while they cackled maniacally. A light flared to life inside the distant hut, and the door opened with bang. "WHO IS THAT ON MY LAWN?!" shouted an irate orc. The pair looked at each other, mirth forgotten. "Go, go," whispered the orc breathlessly, scrambling to her feet. They took off, trailing vines behind them. Two days later, having slept the previous day away, the orc turned up early in the leatherworking shop and discovered several lengths of hop clusters in her bag. I must have carried them with me, she mused, not remembering much after the party. With no pressing matters on the schedule, she decided to put her idle hands to work and make a gag gift for her partner. Three hours later, she had a fairly convincing pair of gloves, which she placed on the tauren's worktable. She rationalized the use of valuable leather as practice rather than waste. After all, the design was still new, and she needed to make good armor for the druids that commissioned the shop. Stomach rumbling, she closed the workshop and went in search of some grub. Upon returning to the workshop, the orc noticed that several other leatherworkers had trickled in during her absence. The tauren was seated at his table, pretending to peruse a Cenarion Circle missive. His eyes were still a little red. The orc strode over to him and slapped the table good-naturedly, causing him to wince slightly. "Did you get my present?" She gestured to his desk. "I made your a pair of gloves and left them on your table. A special pair of gloves," she prompted, grinning. He showed no recognition. Frowning, she continued, "A Brewfest...pair of gloves...?" Another leatherworker, an unusually slender goblin, strode into the room. Hearing only the last part, she piped up, "Oh, I found those gloves you made and added them to the shipment to Shattrath. The vendor there can't seem to keep anything in stock, so it was great you made extra!" She continued about her business, oblivious to the frozen silence she left in her wake. The trouble seemed far away now, safe in the bright room in the valley. Dust motes pranced through the sun shafts, heedless of the quiet inhabitants. "I didn't tell anyone else in the workshop but you. I sent a courier to Shattrath, but by the time he arrived they had sold the pair, and the druid wore them into battle before he heard of the mistake. It's a miracle he survived wearing what should have been a party favor." 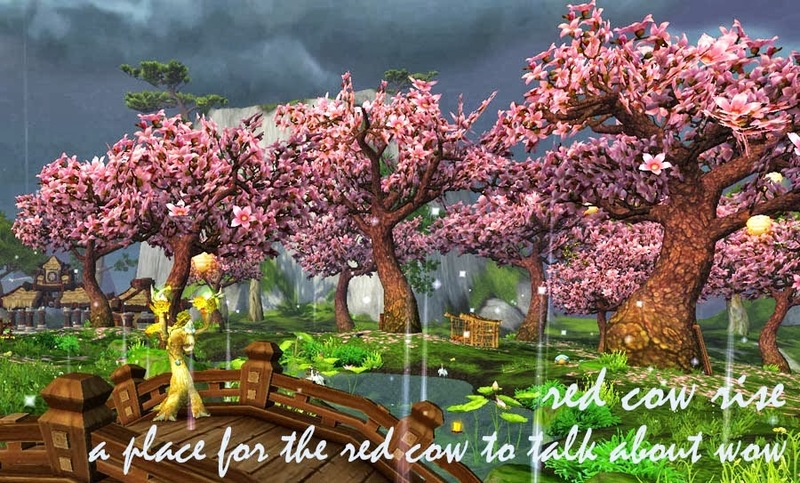 "All's well that end's well," the tauren said consolingly. "Just think of all the time we wasted gathering vines the hard way!" The orc threw back her head and began to laugh. The tauren looked on, smiling, as she laughed herself silly. After several minutes, her giggles subsided and she wiped tears from her eyes. The tauren watched this with polite amusement. "What was that all about?" "I don't know," she said, gently clapping a hand on his shoulder. "I'm just glad you're back." Is everyone level 90 yet? Every expansion I read tons of posts about preparing for the coming content and think "Oh, yeah, I should stock up dailies and crafting mats." And then I don't. Of course, I know I'm not exactly in the running for realm first of anything. I'll get to max level eventually, probably soon after I start getting heckled by guildies to catch up and run dungeons with them. This past week I started logging in more, and more regularly. Amazingly, stuff got done! I got to see the Theramore scenario, took care of the new Scarlet Monastery, finished up my last achievement in Tol Barad, and powered through the last few achievements I needed for my Cata heroic dungeon drake! Many of those were thanks to Rades filling out our guild group of four, and he got his drake too! On Tuesday I was at school for most of the day, finally coming home late and playing way past my bedtime. Everything is so great!! I started my pandaren monk and was extremely surprised to see that the starting zone was pretty empty. I suppose by that time everyone was already level 30 or so. The music is much more varied than in the beta, and it's so good! I'm really enjoying listening to it while questing. Earlier today, instead of making flashcards like I should have been, I instead logged into my main to start up ~pet battles~. If you haven't looked into it yet, I found what appears to be a great addon for that called PetBattle Teams, which does exactly what it sounds like. I hope you can name the teams! In other news, for the two of you following the fiction updates on the blog, I've compiled the timeline on the Series & Resources page immediately under the Leatherworkers section. Hopefully it makes the progression clearer! The tauren's eyes fluttered open as Hadakha rose from his side, ready to make room for the next shift in the healing rotation. A callused hand reached out and grabbed his arm. He looked down at the ravaged form as the tauren's mouth moved, then bent down and offered a trickle of water to his patient. After moistening his lips, the tauren croaked "Thank.....you." Hadakha patted the hand on his arm and gently laid it back on the bed. "I'm glad to help, my friend." He stepped toward the door and, hearing the commotion outside, turned to appraise the tauren. "Do you think you can handle visitors?" he asked wryly. The corner of the tauren's mouth lifted slightly in response. "Don't.....let her......get to....you. Not.....your....fault." Hadakha nodded soberly and strode out of the room, almost running into the orc standing right outside. They stared at each other for a long moment, Hadakha meeting her angry, bitter gaze calmly. He put his hand on her shoulder. "He is awake. You can see him now. Try not to tire him out." The orc snorted, shrugged his hand off and pushed past him into the room. He exchanged knowing looks with the short, matronly troll woman who was his replacement shift, and strode out into the late morning sun. Suddenly an arm linked through his, and he found himself walking alongside a very cheerful druid. Akabeko grinned at him. "Good morning! How's your energy? Feel like doing some real training?" "You're certainly in a good mood today. Any particular reason?" "I've just had a very relaxing break, now that you mention it! Although" she frowned, "someone defiled the grave of an old guild member, Dahakha – he was before your time. If I ever find them..... You okay?" Hadakha nodded as he recovered from his stumble. "So, let's go do some multi-target training! I'll just need to grab my kit from HQ first. You should probably bring some gear too." Five minutes later, they entered the guild headquarters. As they headed for their rooms though, another guild member burst in, wildly looking around. "Quick! You guys gotta come see this! The Horde has assaulted Theramore!" Hadakha and Akabeko looked at each other. As one, they bolted for the door, dashing out into the excitement that was starting to sweep Orgrimmar. A goblin had set up a small podium and was speaking into an unnecessarily complicated megaphone. The druids pushed their way through the crowd, listening to her steady stream of reports. "...framed as a mission to rescue a captured Horde spy ended with an aerial assault on the Alliance outpost Theramore. Through superior goblin technology and the might of the Horde, the endeavor was a success. Horde casualties were minimal, and Theramore lies in ruins. So far, the deaths of prominent Alliance members, including Jaina Proudmoore, are unconfirmed. For more news as it breaks or a commemorative plaque, please see one of my associates near the podium. For the Horde!" The cry was taken up by her associates and some in the crowd. She began her spiel again. "Early this morning, Garrosh Hellscream, Warchief of the Horde, directed a military maneuver framed..."
Around them, commotion surged as newcomers pushed forward to listen and those who had already heard retreated to talk amongst themselves. Hadakha turned to his guildmate and found her stock still, gripping both of her braids with more force than necessary. "Aka?" he said, repeating himself to be heard over the hubbub. She shook herself. "Why would Hellscream attack Theramore unprovoked? What news has there been recently that suggests it's a threat?" "Maybe we're not privy to all the information the Warchief is." He wrinkled his nose. "Although you'd think there would be more prelude to a major event like this." Akabeko opened her mouth as if to argue, then visibly wiped the concern from her expression. "Perhaps I should have been following current events more closely. Then again, I’m just a cog in the war machine. I’m sure the Warchief has his reasons. I'm...going to get one of those newspapers, and then we are going to train properly." "Right," Hadakha agreed. He nonchalantly offered to carry the newspaper after watching the way she wrung it between her hands. You may recall the horrible experience that was gaming on my laptop. Having finally moved into my new apartment and set up my PC, I was finally able to sit down and play for many uninterrupted hours today. It was awesome! On Monday, Navi invited me along to a Laid-back Raid, which I joined from Lady Deathwhisper up until too many people had to go before Lich King. I got to finish Valithria on heroic! Hooray! Sadly, I spent the rest of the day unloading the shopping and trying to put my life back into cabinets and shelves. This morning I woke up, went to school long enough to find out my class assignment and officially register, and then it was time for FUN! I logged into my main! There were pets and mounts everywhere! I did quests in Tol Barad because GIMME DAT FOX. Then I switched over to my mage (hey do you guys even remember Sprinkie) and actually quested! For a while! Now she is at 81 and in Vashj'ir, but sadly those mobs are still beating on her pretty hard :( Why am I so terrible at mage-ing? Is it because I'm too cheap/lazy to buy glyphs?!?! The craziest part is that when I ported out, ending up near the Tol Barad portal in Org, I saw a name I recognized...Dragonray was standing RIGHT. THERE. We got to chat, which was great, and now we are totes ~battletag friends~. I'm so glad my friends list is starting to actually have people online!! Note to self: make an effort to be sociable OR ELSE. Lately I haven't had much to say outside of storytelling, because aside from the ongoing storylines in my head, there wasn't anything happening to me! But now that I can actually play again, just like that, the switch is back on, and the floodgates to CREATIVITY are open! It had been a long week. More than that, it had been demanding, time-consuming, and exhausting. More than that, it had caused Akabeko and her co-conspirator to miss their one-week opportunity to access the Darkmoon Faire, and neither was particularly happy about it. At the urging of those close to her, Akabeko had agreed to go home for some refreshment. Fortunately, she could truthfully say that visiting her family was relaxing. She knew too many who avoided going home for fear of fighting, nagging, criticizing, and the silent treatment. Even so, she hadn't particularly wanted to leave her workshop or her...plans. The plans had likely been the reason Katza had so strongly insisted she go. It was strangely satisfying to slip back into the calm, deliberate lifestyle of Camp Narache. Akabeko, who frequently snatched her companions from the fingertips of death, who had felled the greatest of foes, who knew the greatest fighters of the age, could still be put to work fetching water and chopping potatoes. Now she just did it with a little more pizzazz. Her mother filled her in on the necessary goings-on: what her brothers, both of them Bluffwatchers, were up to, who was courting who, which hunts had been most successful, the recent drama of the shared vegetable patch. During the day Akabeko was sometimes called to heal injuries, other times to instruct the fledgling druids of the camp. At night she ate at the central bonfire, because her neighbors never tired of hearing news from abroad. At least it had been a nice trip, if not all that refreshing. Although she never mentioned it, Akabeko wasn't sure she could feel completely at ease anymore. She suspected many in her line of work felt the same. The sharp pain of many losses had faded over time, as it should. In fact, she was quite capable of ignoring it. Rather than pain, she simply felt empty. Life continued perfectly normally, except for the dissatisfied emptiness lurking at the back of her mind. It was like never getting quite enough sleep, not feeling perfectly full, missing the last drop in the glass. Understanding that the emptiness was part of her now didn't feel like giving up so much as acknowledging reality. Gloomy thoughts, she chastised herself, pumping her wings and leaving the thoughts behind her. I should have a clear mind for this. Akabeko tucked her wings and dove. She could feel her tiny heart fluttering at the same time her tauren emotion threatened to pull her back into birth form. It wasn't any special holiday, but at dusk spirits were known to come visiting. Could she really be that lucky? She couldn't move fast enough. Unaware of the stormcrow hurtling towards him, the spirit shifted into cat form. Akabeko recognized the gray mane, and was now close enough to pick out the metal tips on each horn. She screeched plaintively. Wait for me! I'm coming! The cat faded into nothingness. She screeched again in despair, willing herself to fall faster. Finally she braked, landing sloppily and rolling awkwardly to her feet. "Spirit," she gasped, loping through the graveyard. "Dahakha. Dah!" Her head whipped left and right, looking for any sign of the bull or the cat she had seen. The graveyard was completely empty. Defeated, Akabeko returned to Dahakha's memorial. "Spirits," she choked out, leaning over the memorial as she caught her breath. "Why? Why would you-" She squeezed her eyes shut in frustration. Soon, her breathing calmed and her heart quieted. The plains of Mulgore were completely in shadow. She knelt to pay her respects to her friend, looking at his memorial in the murky twilight. Something wasn't quite right. She reached out, touching the space below his name engraving that her eyes had already confirmed as empty. The last time she visited, she had brought a lockbox as a gift and left it beneath the totem. Now it was gone. Her features drew into a considering frown. Although it was possible that a quillboar had wandered into the graveyard to loot, the frequent tauren patrols in the area almost entirely discouraged it. Any self-respecting tauren would never defile a resting place by stealing, and non-tauren had no reason to be in Red Rocks. Her hackles rose in anger. A twinkling in a nearby copse of trees became brighter and brighter as twilight faded into night. Enraged, Akabeko shifted into travel form and raced towards the glimmer, hoping to catch the thief. Closer to the light, she shifted back in preparation for a fight. This close, she could make out a glowing engineer's wormhole. Mystified, she looked in vain to see where the wormhole led. The wormhole winked out, plunging her into darkness. Just a little bit for you today. You may recall the Warcraft Movellas writing competition over a month ago. When I saw the prize list, I suspected it was too good to be true, and it seems that it was. Of course, simply being recognized was a pretty great prize, but when I got an email asking for my address I thought I might actually get a new keyboard! Alas, a month and unanswered emails later, I have to admit that these guys aren't going to come through, and that's kind of disappointing! I'm so bummed that I'm missing so many weeks of pre-expac excitement! I want to be trundling around everywhere as a crazy tree, whacking miscreants left and right with my leafy branches. My friend recently sent me a very intriguing GW2 video which had some legitimate criticism of WoW, but I still like it! I like the quests and the grinds and the gameplay! UGH I just want to hole up in my room and play!! Finally, I would also like to read the new novel, but why on earth is the kindle edition five bucks more than the paperback? BUH. The room was quiet when the orc slipped inside. She had waited for the druids to finish their healing and leave, and it was late enough that she didn't expect any other visitors. The tauren-shaped lump in the center of the room's single pallet was still, save for its shallow breathing. The orc sat cross-legged at the head of the pallet and looked at her friend. The tauren looked terrible. Even in sleep, his eyes clenched and unclenched in pain. His fur was dull and dry and rasped against the bedding when he moved. This close, she could hear a faint wheeze in his labored breathing. The orc had never seen him look so bad. Her chest constricted painfully. "Huh," she grunted. "Usually you're the talkative one. I don't know quite what to say." She huddled in silence, eyes never moving from her partner. Finally she shifted, stretching out a leg and rolling her neck. "Do you remember," she croaked, cleared her throat, and tried again. "Do you remember the first time we went hunting Crust Bursters in Blade's Edge Mountains? The Cenarion Circle barely looked at the paperwork before approving them as a source of chitin." She huffed out a laugh. "Do you remember the heat? It was awful down in that valley. But we didn't want the mature ones, we wanted the little ones because their chitin was much more flexible." She remembered the flat expanse of rust-colored rock, the tense wait for the slight vibration underfoot, the telltale pebbles bouncing and jumping as the underground worms approached. They had collected ravager parts for bait and strung them up one by one, waiting for the ungrown worms to surface. "They came shooting out of the ground with their ridiculous too-short legs. And that one that couldn't find its way back underground! They should be grateful we put that one out of its misery. Do you know that was my first assignment back on the job, our first assignment together? I had been out of the game for a while, and you were pretty fresh as well. I admit to having some misgivings about your ability." The orc leaned her head back against the wall. "Perhaps it doesn't count as a confession if you aren't awake to hear it. You could probably tell, anyway. I don't know if I was particularly friendly to you at the time." The work had gone surprisingly easily. The wormlings would emerge from the ground, intent on the stinking ravager carcasses, only to find themselves snared in a continuously tightening trap. It was easy work for the orc to step in and end their suffering. "I was very impressed by those traps you custom-made. I guess you developed that talent when you were still a hunter. Those traps made me reconsider my opinion of you. It made me think we might work well together." They had been preparing the corpses, removing the chitin and gathering the remains for disposal when the real rumbling had begun. "I had thought we were getting off lucky, but it never seems to work out that way for us, does it?" The orc shook her head, a half-smile on her face. "When that adult Crust Burster found us I thought I might have to sacrifice you to escape." She paused and looked guiltily at the tauren. "Kidding. Anyway, it was quick thinking on your part to toss all the leftover ravager parts away. I was still torn between all the chitin I was holding and the axe at my belt!" She shook her head again. "When I finally came to my senses you already had the wyvern ready to go, and we got away with most of the loot. I remember thinking, 'I have to work harder so he doesn't have to come to my rescue.' That's when I knew I wanted to work together again." The room fell silent. There was no change in the tauren's breathing. Hesitantly, the orc smoothed the mane on her friend's forehead and stood. "Spirits be with you," she said gruffly. She didn't look back as she left the darkened room. As I was taking this some noob driving by yelled "Hey, Avatar!" I was really hoping to have more time to play WoW this summer! Even though the speed and graphics limitations on my macbook are pretty discouraging, there have been some evenings where I've wished I could watch Scrubs reruns and level or grind Tol Barad tokens. I lost a lot of time having to wait for an OS upgrade and then convince my mom to let me use the keyboard from her computer, not to mention all the traveling I've been doing. Then again, the traveling has been pretty rewarding. I got to visit my grandparents, get my long-awaited tattoo and bonus ear piercings, visit my best friend, and see my cousins in New York. I explored Cathedral Caverns, got to eat fantastic food, saw a Broadway show (Rock of Ages), met a chiweenie puppy, and now I'm getting to enjoy a convention of nerdfolk! Sadly, I am extremely behind in my blog reading. I've got almost 2 weeks worth of posts to work through, along with hours and hours of podcasts for listening! If you get any comments on really old posts, well that's why. However, while it's still relatively new, you should go and appreciate this wonderful fanart Kamalia made for me and Navi's scheme at the Darkmoon Faire! It's completely perfect, and I love the detail of everything on the desk! More things to look at!